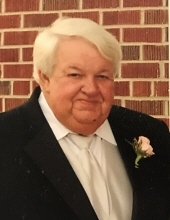 Celebrating the life of Paul "Butch" Henderson, Jr.
Obituary for Paul "Butch" Henderson, Jr.
Mr. Paul "Butch" Henderson, Jr., age 73, of Rockmart, GA passed away Monday, September 10, 2018 in a Rome medical center. He was born in Rome, GA on March 12, 1945, a son of the late Paul Henderson, Sr. and the late Bessie Mae Baines Henderson. Butch lived all of his life in Rockmart where he was co-owner of C & D Construction. He was of the Baptist faith, was an avid NASCAR fan and loved to fish. He was preceded in death by his father, Paul Henderson, Sr., mother, Bessie Mae Davis and step father, Johnny B. Davis. Survivors include his daughter, Brook Swan and her husband, Jody; son, Kyle Henderson; former wife, Pearl Henderson; two grandsons: Lucas Swan and Konnor Swan; and sister, Connie Simpson, all of Rockmart. Funeral services will be held Thursday, September 13, 2018 at 11:00 AM in the chapel of the Alvis Miller & Son Funeral Home with Rev. Barry Snapp and Rev. Owen "Bud" Davis officiating. Interment will follow in the New Prospect Baptist Church Cemetery. Pallbearers will include: Lee Nolen, Chris Nolen, Joel Gutherie, Jesse Paris, Kyle Henderson and Eddie Newman. The family will receive friends Wednesday evening from 6 until 8 PM at the funeral home. The Alvis Miller & Son Funeral Home is in charge of arrangements for Mr. Paul "Butch" Henderson, Jr.
To send flowers or a remembrance gift to the family of Paul "Butch" Henderson, Jr., please visit our Tribute Store. "Email Address" would like to share the life celebration of Paul "Butch" Henderson, Jr.. Click on the "link" to go to share a favorite memory or leave a condolence message for the family.